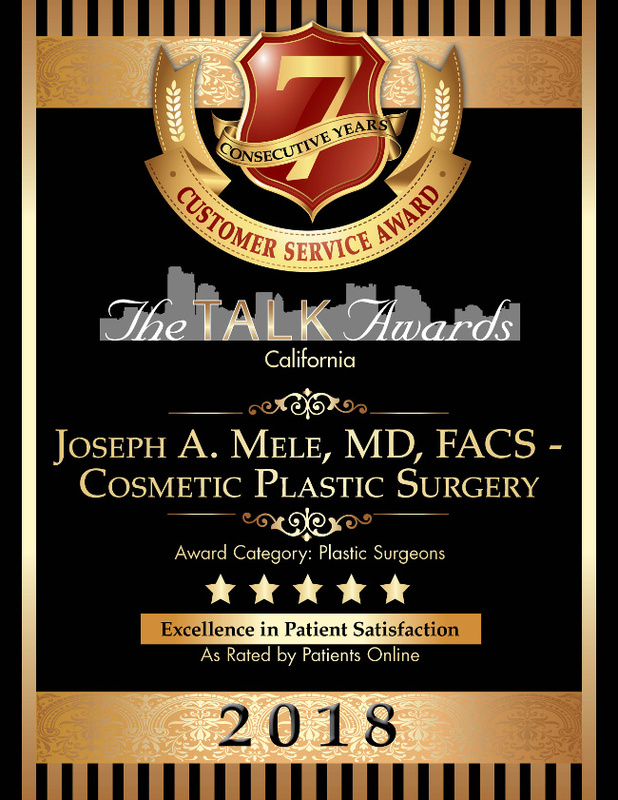 For the 7th year in a row, Joseph A. Mele, MD, FACS, received the Talk Award for Customer Service in Cosmetic Plastic Surgery. Thank You to all my happy patients who took the time to write a review. Thanks to you, for the seventh year in a row, Joseph A. Mele, III, MD, Inc., has received the Talk Award for Excellence in Patient Satisfaction. The Talk Awards were created to calculate customer satisfaction ratings for a variety of businesses, based on customer feedback online, and help businesses gain control of their image and reputation by providing consumers a fair and unbiased overview of their business. Both business owners and consumers search our award pages to see who has received top honors. Only the highest rated businesses, those with a 4-star to 5-star rating, win The Talk Award. There are hundreds of new websites dedicated to rating almost everything on the planet. Because these websites are typically free and uncensored, they can be scathingly accurate. For better or for worse, even large review sites, like Yelp, state right in their terms of service, “Reviews will not be removed because they are false.” It can be confusing, but millions of people are using these sites as referrals before jumping into any new product, service or whatever else they are going to buy. Thank you to my patients for this wonderful and humbling award. Thank you for all your kind words. When it comes to Cosmetic Plastic Surgery, how patients feel about their results is the bottom line. It is a privilege to practice Plastic Surgery in the San Francisco Bay Area, and my goal is make you glad you came into my office. Thank you for selecting me as your preferred Cosmetic Plastic Surgeon. I look forward to serving you for years to come.